Service your car every 10,000km or every 6 months, whichever happens first. Many people ask us how often they really should be servicing their car. Are the service centres greedy? The answer is actually not what you think. The simplest way to remember when to service your car is every 10,000km of every 6 months, whichever happens first. Although new cars have an automatic light which indicates when your car should be serviced, some manufacturers are still indicating a car should be serviced every 15,000km or every 12 months, whichever happens first. In my many years in the trade I have seen vehicle after vehicle come in for a 12 month service as recommended by the manufacturer and leave with a hefty bill and a disgruntled customer. The customer was simply following the manufacturer’s recommendations, yet 12 months is a long time to wait to discover an issue. Especially if the issue starts in the second or third month after a service. Because of this, we at Northside Auto recommend that car services take place every 6 months or every 10,000km. That way we can identify any problems before they become major problems. Depending on the make, model and age of your car there are different checks we perform and different parts we replace. The most common parts and fluids include light bulbs, seals, spark plugs, oil, coolant and windscreen wiper fluid. 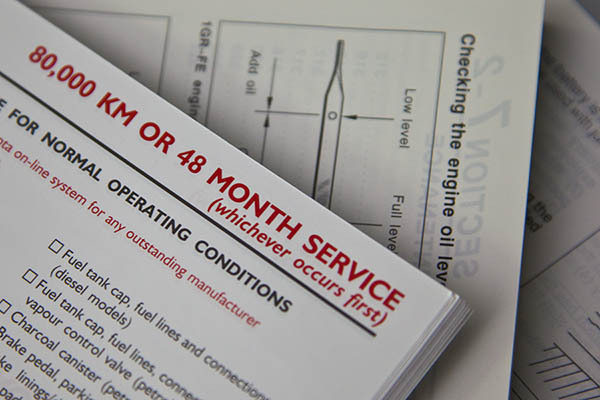 To retain your warranty the log book must be stamped by the service centre and parts/lubricants used must be of equal to or better than the original vehicle manufacturers specifications. Again, depending on the make, model and age of your car we can provide you with a cost estimate of your vehicle service. This will include the checks and repairs quoted above, or specified in your manufacturers manual. Once the car is in the workshop we will also run our diagnostic software over the car’s computer to determine whether there are any other faults. Northside Automotive will always call to discuss any repairs and associated charges with you prior to performing the work. The good thing about having your car serviced every 6 months is that we are able to find any issues early and deal with them before they become expensive problems. We know that car repairs are the last thing you want to be spending your hard earned money on and that the relationship you have with your car repairer is the same as what you have with your dentist, unpleasant, but necessary, but we all know that prevention is better than cure, so I guess we will be seeing you around the traps, every 10,000km or 6 months, whichever happens first.